Barcelona, Spain – Today at Mobile World Congress, Nokia unveiled five new affordable handsets including a new family of smartphones debuting on the Nokia X software platform. Based on the Android Open Source Project AOSP, and backed by Nokias deep ties with operators, the Nokia X platform gives AndroidTM developers the chance to tap into, and profit from, a rapidly expanding part of the market. 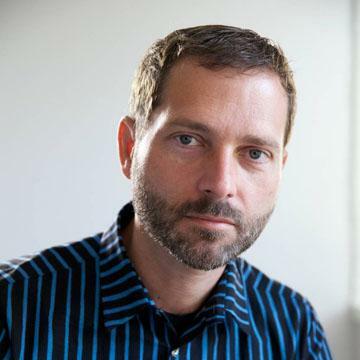 via Nokia welcomes Android developers; expands global developer footprint with momentum across Lumia and Asha » Nokia – Press. It’s worth remembering the distinction between operating systems, platforms and ecosystems. Devices are commoditizing, operating systems are commodities and the Android platform is a commodity. Value will not be captured in any of these technology modules. Ecosystems are another matter. It’s where Facebook (and its acquisitions) reside. It’s where Google lives and it’s where iTunes has been for a decade. Nokia’s adoption of AOSP as an operating system is consistent with the ecosystem strategy set forth three years ago, and is also consistent with Microsoft’s competitive strategy. Which is why I believe Microsoft is not only comfortable with this development but had agreed to it over a year ago when work on this initiative was already well under way. The orthodox vs. the unorthodox: Tata, Tesla and Toyota. Why might an asymmetric competitor lose and a symmetric competitor win? We begin with Tesla and Apple. We continue with aluminum vehicles and re-visit information asymmetry as Horace exploits it to buy a Mercedes on eBay. We talk about car APIs (Aux input jack and ODBII) and much, much more. A brief discussion considers the perils of endless line extension up and down the market, perhaps fueled by financialization. Asymcar 10: Asleep at the switch | Asymcar. Highly performing newsletters with open rates of more than 50%. 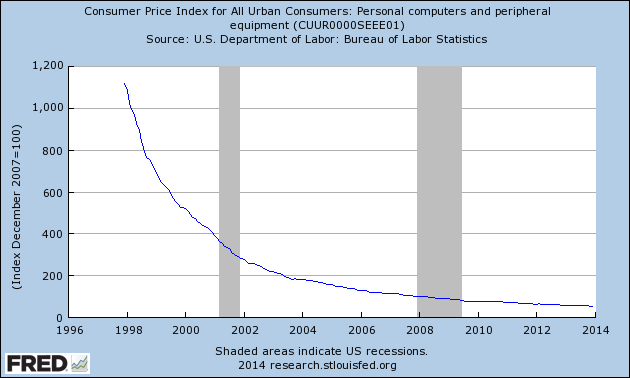 The price index suggests that prices for computers should be 54% of 2007 levels. Charles Arthur illustrated this on a global basis using a separate set of data. The data shows that the weighted average selling price (ASP) of a PC has fallen from $614.60 in the first quarter of 2010 to just $544.30 in the third quarter of 2013, the most recent date for which data is available. 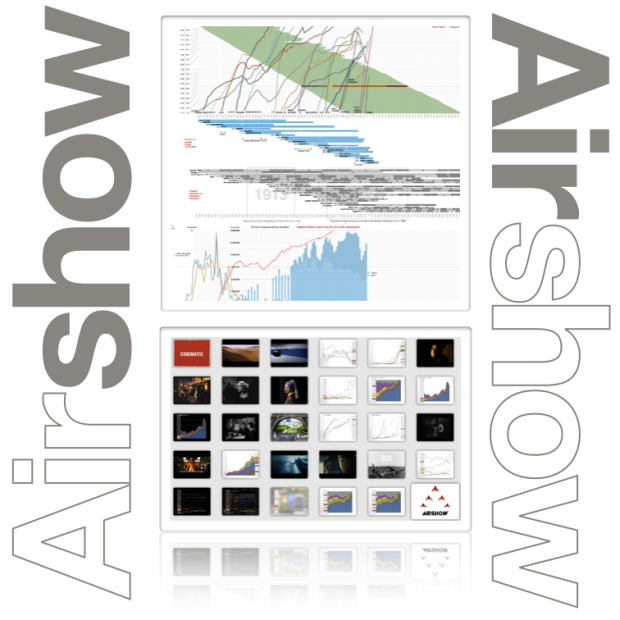 We will be conducting our 8th Airshow event in London next Wednesday, 26 February 2014. Few seats remain. Discounted registrations are available for readers of this blog, and students. Prior to Apple’s earnings report I read at least one article suggesting that the most important indicator to watch was Apple’s margin. I suppose this was due to a recent decline in margins from a peak gross margin of 47.4% in Q1 2012 to 36.7%. As the graph below shows, margins began to recover by Q3 2013 and are nearly on par with year-ago levels. This is not quite catastrophic. 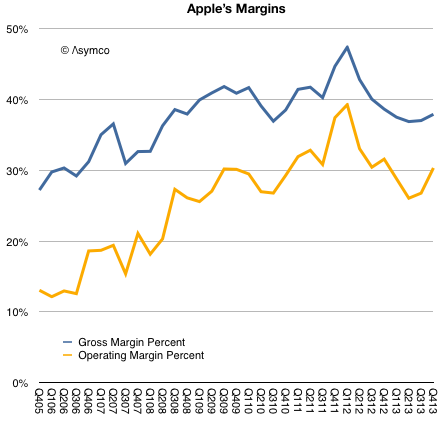 To better understand margins, it helps to compare them with other companies. When Apple reached that peak of near 50% gross margin I noted that such a level was higher than Microsoft’s and Google’s. The irony being that Apple was nominally an (implied) low-margin hardware company while Microsoft was an (implied) high-margin software company and Google was an (implied) high-margin internet services company. Horace Dediu and Guy English discuss the future of TV, how we consume media, and the fate of console-style devices. From Apple to Nintendo and beyond, is there one box to rule them all, or can there be? via 1: Bicycle for the Mind. Barry Braverman’s website, and his IMDb credits. Horace and Moisés discuss the excitement surrounding Microsoft’s hire of new CEO/poet Satya Nadella, Apple’s recent numbers announcement, and yet more on Google (and their sale of Motorola to Lenovo). via 5by5 | The Critical Path #111: Man of Arts and Letters and Science.